Word families worksheets are a fun and effective tool to help young students identify patterns in words that will help them on their path to reading and spelling proficiency. 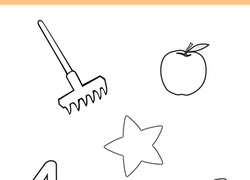 These colorful worksheets are full of fun illustrations and creative activities that keep kids learning and engaged, including enjoyable rhyming and sorting games, word family mazes, and reading and writing exercises. Get in some phonics practise with this rhyming words match up! 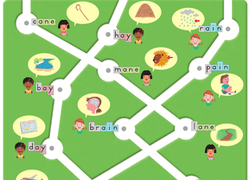 Kids will match each word to a rhyming one in the word bank. Kids sort long A vowel words in this worksheet. Can you find a rhyme? Find out with this colorful worksheet! 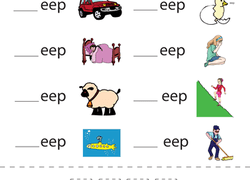 Children practise their reading skills and familiarize themselves with the "-eep" word family in this cut-and-paste activity. 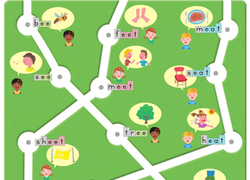 Your first grader will have a great time in the park as she comes up with rhyming words to complete these word families. Help your students develop their spelling skills by using association. Students will practise reading and sorting word family words in this fun cut-and-paste activity page. Test your child's mastery of the rhyme with this worksheet that challenges her to fill in the blanks in the rhyme-filled poem "Cats on a Mat." Spelling doesn't always have to involve a pencil! Use this cut-and-paste activity to help your students practise spelling words in the -ike family. Cake or cat? Kids find long vowel words that match pictures in this phonics worksheet. Learn to spell by sounding out the word before you spell it!